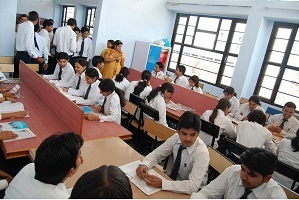 SPSAD envisions producing well groomed personalities with excellence in architectural skills. School is committed to produce preeminent Architects of the nation to face the challenges of future gallantly and integrate the cyber era with physical and social environment resulting in a Nation, developed to meet global needs. School shall develop as a centre of emerging neo-thoughts and designs by providing the budding architects a holistic education structure and platform to experiment and perform. The basic mission of the Trust is to provide education and training to all eligible students and aspirants of learning, in various disciplines, irrespective of their caste, creed, color and community. The Trust is committed to provide highest quality infrastructure and education in selective fields of Technical Education through SPIET & Architectural Education through Sat Priya School of Architecture & Design. Some people live and die for their values and those are the people who achieve all heights in their career. At Sat Priya, we teach our students, values for life and their importance for achieving the goals they have set in their career. We believe that all individuals are equal and to impart equality in them we have dress code applicable in our institute and all students enjoy it to a great effect. These are the kind of values what we inculcate in students at Sat Priya.